Quick report here with some pics and a special offer for the CBBT! First the report. 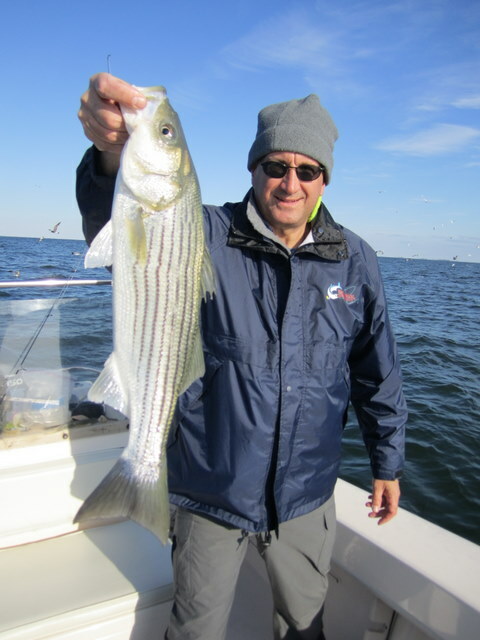 I was fortunate to fish with long-time client and good friend Jack McKenna twice in the past ten days. Jack is an ardent fly fisherman, and just plain good company. 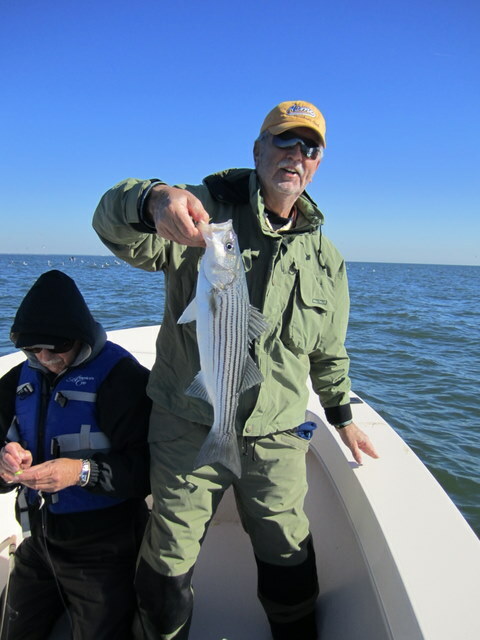 We fished the Little Choptank last week, and just yesterday spent the morning casting to breaking rockfish between Crisfield and Tangier Island. The False Channel held a good grade of stripers for us last Friday, with Jack’s biggest tugging the boga down to near eight pounds. 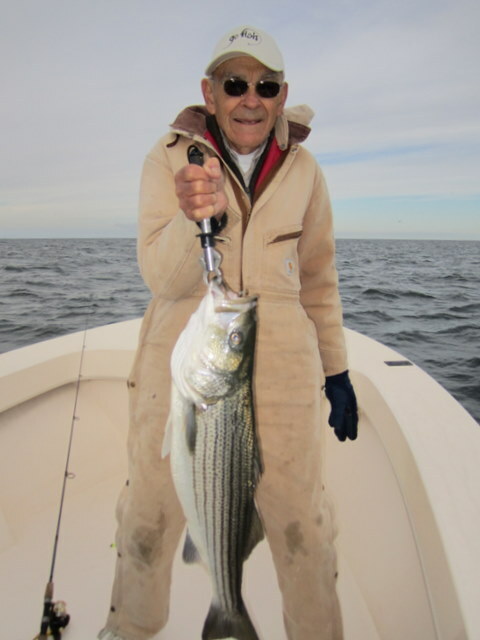 With the wind and tide helping, Jack said that was the hardest fighting striper he had ever landed on his nine-weight! The fish was near as wide as it was long – probably full of bunker. I was ready with my Shaggy Shad from Specialized Baits. Yesterday was a very cold morning and I had to clear ice from the boat before we left Somers Cove – and I keep in on a trailer. The seas were fairly calm as we left the Little Annemessex river and headed south towards Tangier. It wasn’t long before we saw the first of the birds working steadily over feeding rockfish. We chased school after school between Fox Island and Tangier Island, Jack catching on his nine weight with a 350 grain sink-tip, and me dredging the bottom with my Shaggy Shad, sweetened with a 6 inch BKD (Bass Kandy Delight). 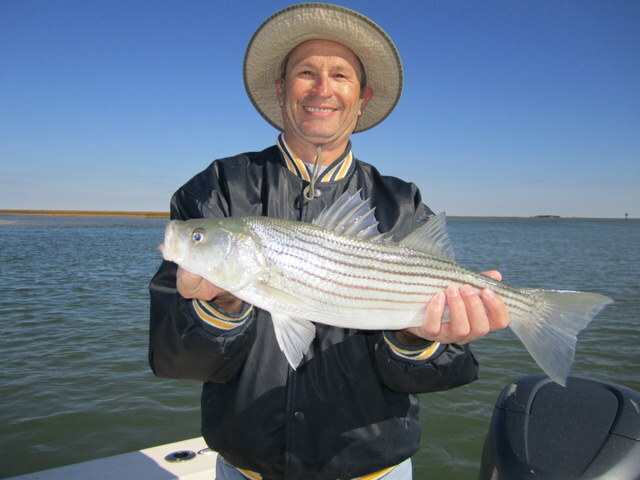 We enjoyed steady action with 18″ to 22″ stripers until we broke for lunch around noon. 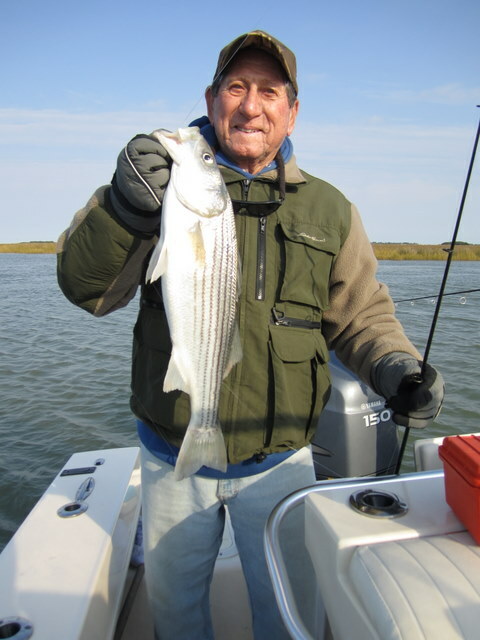 We ended the day pulling a couple of rock out of a Smith Island creek where the water temperature was holding steady at 49 degrees – perfect for creek rockfish. 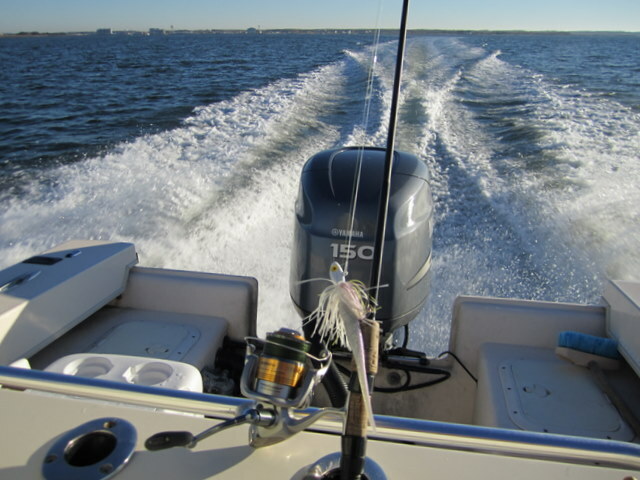 The wind dropped out to nothing and we had a great ride back on just a beautiful fall day on Tangier Sound. This fast fishing should last another week or two and then I’ll be heading to the CBBT. 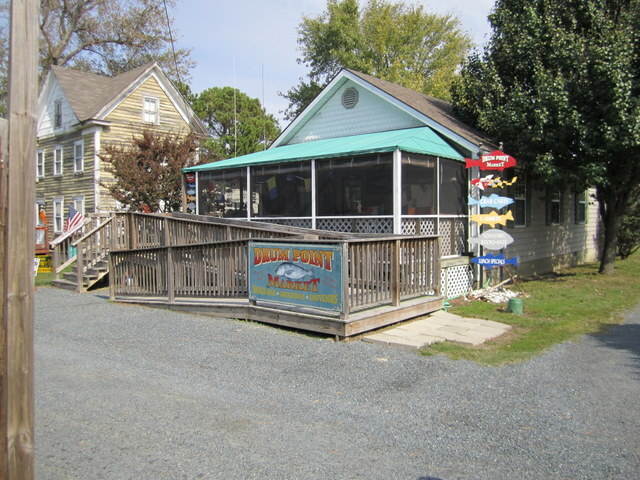 If anyone wants some fun, fast fishing out of Crisfield, give me a call! I have a few holes I would like to plug at the CBBT, so I’m going to lower my daily rate to $500 for two people, down from the usual $550. All tackle, ice, drinks, snacks and Virginia license is provided. If you prefer to meet me in Salisbury on the morning of the trip, I’ll even provide the transportation in my comfortable, brand new, 4-door Ford pickup. Call or email me for details. The big rock are down there as I write this and it should only get better. Don’t miss the boat (or truck) on some great fishing!! North 20 – 25K, North 20 – 25K, North 20 – 25K…..
Man, last week was like the movie Groundhog Day. It blew it’s pants off for seven straight days. And the 20 – 25 knot days were the days I fished! It was worse earlier in the week. 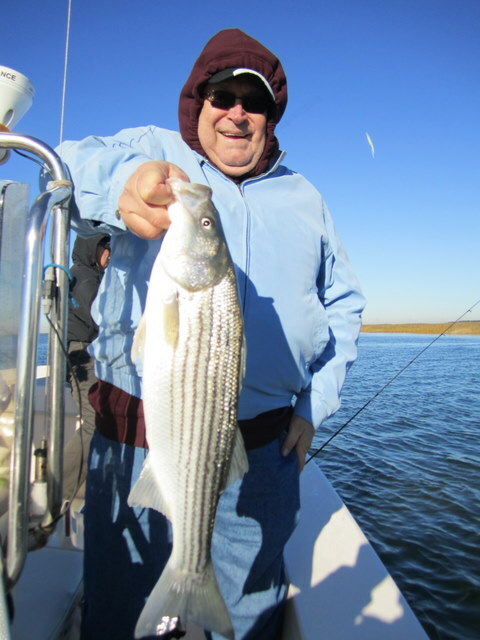 The first fish-able (and I use that term loosely) day was Wednesday, when I fished the Choptank River with Jim Lee and Chris Jones. I launched at Cambridge (don’t have a Talbot County permit) and ran the JB down-river, where I met them at the Oxford ferry dock. Nice run in the morning and it gave me a chance to survey the bird activity – not much. There were a few dippers hovering over a small school of feeding rockfish right at the Cambridge bridge, so I logged that away for future reference. After picking up my crew, we headed down-river to look for birds and breaking rockfish. 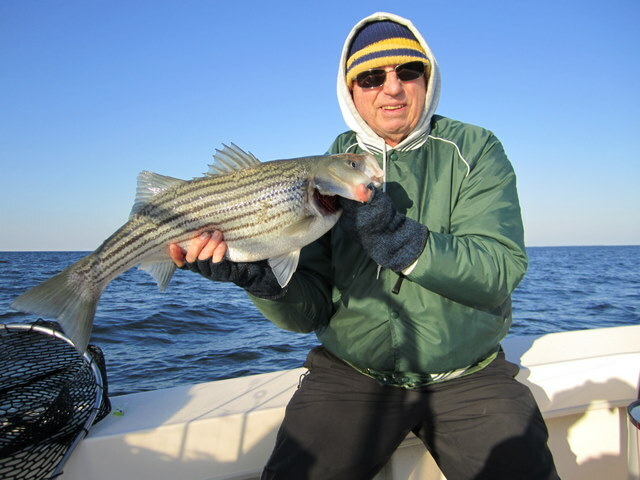 Both Jim and I had heard rumors of large stripers feeding on the surface near the mouth of the river. To make a long story short, I think it was almost two hours before the guys wet a line. It was slow going due to the wind, waves and spray; not to mention being pretty darn cold. We wound up back up-river, looking at the fish finder trying to find that school of stripers I had observed earlier near Cambridge. A small white perch was the first finned critter to come over the side. Oh well, got the skunk out. More perch came aboard, finally a small striper, then another about sixteen inches. Back down-river we went, exploring here and there, where we found a small school of rock and managed to jig up a fat seventeen incher. Around 2:00 P.M. it seemed the wind had moderated somewhat, so I asked the guys if they were game to head back down towards the river’s mouth one more time. We all thought what-the-heck and off we went. As we left the Choptank I continued to run down the length of the False Channel, where, in the distance, I saw a flock of gannets circling and diving over the increasingly calm waters of the bay. As we pulled up under them the finder lit-up with giant “fish marks” and I told the guys to drop the jigs fast. For the next forty-five minutes, using five-inch Bass Assassins on one-ounce lead heads, we battled rock to 12 pounds. 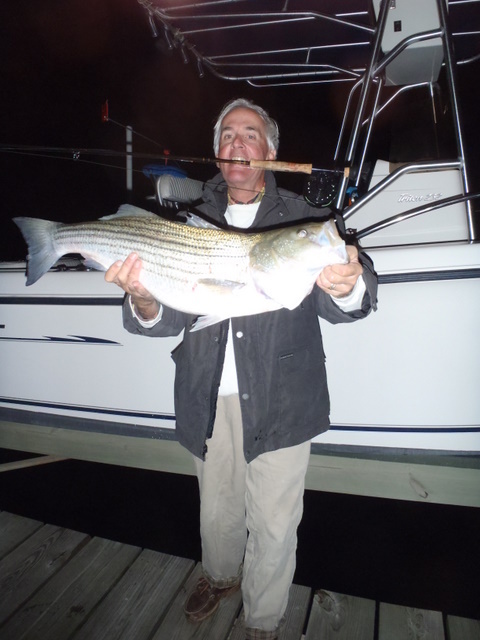 Fresh from the ocean, the hard-fighting stripers were a welcome sight after a long wind-blown day. Several schools of smaller fish popped up, and Jim even managed to snag one or two on a fly. As the sun set to the west, we had a fast, smooth ride back on the suddenly flat-calm waters of the Choptank – go figure. Just goes to show, the fish are out there if you can get to them. 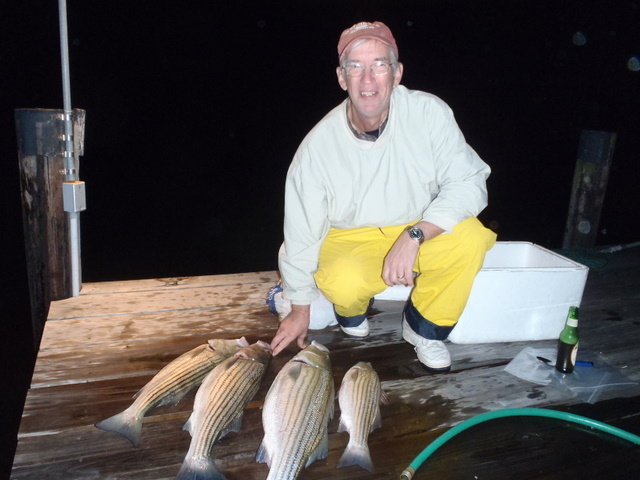 On Thursday, I fished out of Crisfield with Ed Roach, his son Matt and Jack McHale. The wind forecast was for north winds at 15-20 knots – practically millpond calm. Anyway, the guys agreed to give it a try, since I sort of convinced them we would probably, maybe catch fish. The run across the sound wasn’t too bad and once to the other side we proceeded to fish the relatively calm creeks of Smith Island. 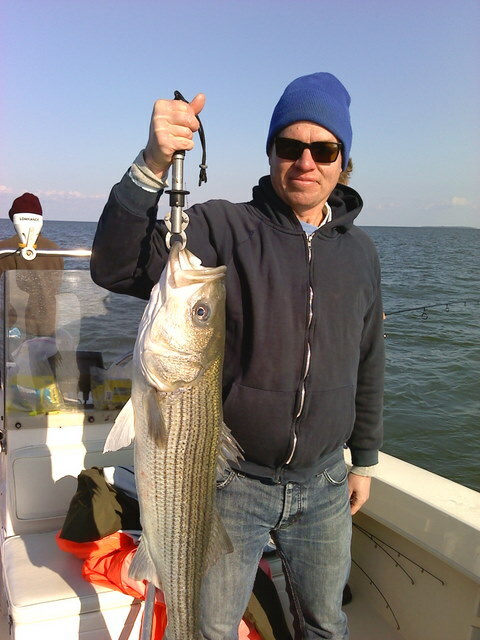 The morning was steady, with a rockfish here and one there, but over all it was cold, and rather slow fishing. With just enough fish to keep things interesting, we came to the days halfway mark and I decided to ask the guys if they wanted to continue plugging along or call it a day. To their credit they chose to continue. Almost immediately, the fishing picked up. Instead of one or two, it became three or four, and we ended the day at a small creek mouth where we caught maybe ten to twelve nice rock in the 20′ to 23″ range. I estimated the days total catch at maybe 40 rockfish, not bad for cold, windy conditions. Thanks for sticking it out fellows. The fish have been constantly on the move, and what has produced one day has not necessarily been the game winner the next. We have been fishing shallow flats, deep creeks and even deeper channels of the main bay with good to great results, but you have to keep moving and working until you find the daily pattern. 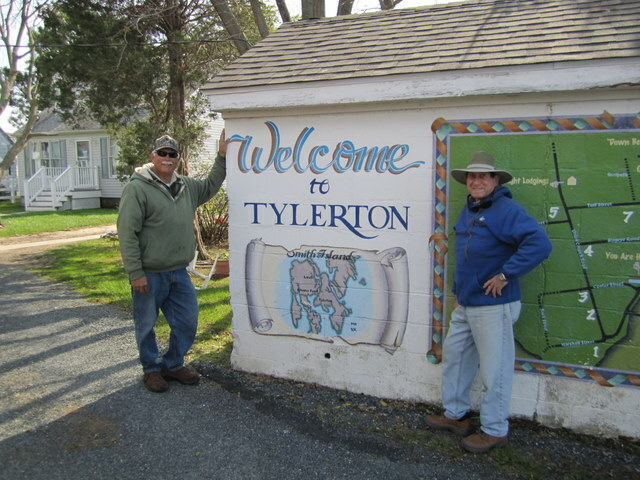 A case in point was a recent trip with Paul Anderson, his son Matt and brother Mike. We had been having great results with breaking fish, but the wind was blowing so that was out. Up into the creeks we went. It was a fair pick of nice size rockfish from 18″ to 23″ casting Bass Assassins and shad tails in the deeper holes of Smith Islands many tidal creeks. The guys were having fun but I thought the action could be faster given the time of the year. I decided to take a chance and travel to a summer-time haunt near Tangier Island, and was pleasantly surprised to find relatively clear water and manageable winds. We anchored up and almost immediately had a triple hookup! The next three casts brought another triple. Good move. The guys battled beautiful, fat 20″ – 24″ rock for over a half-hour when Matt hooked something that wouldn’t show itself. After a great battle, and some skillful maneuvering by Matt, we finally caught a glimpse of the broad sides of what turned out to be a 33″ rockfish!! 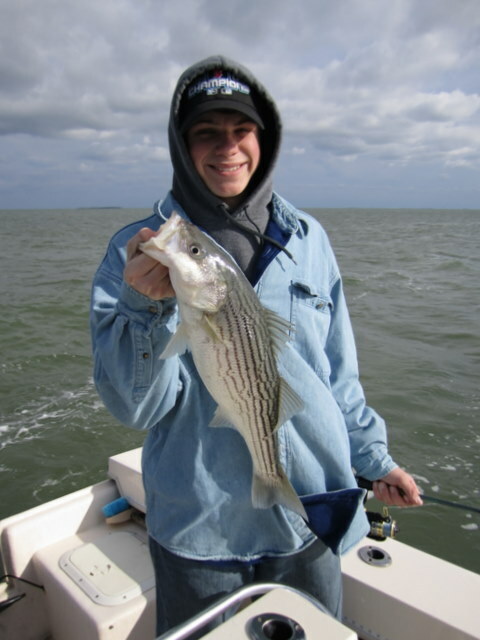 Matt’s biggest striper to date! After a photograph or two the fish was revived and released unharmed. Nice job Matt! The next day brought Jim Lowell and son Chris to my boat. A half-day, evening trip was planned and I was looking forward to a repeat of Friday afternoon. The wind was strong out of the north when I met Jim and Chris at the dock. The forecast was for a gradual let-up as the afternoon progressed. Right. Anyway, it was safe enough to cross the sound, and the guys wanted to brave it, so we made the trek to Tangier across some two-footers, with a touch (or three) of salt-spray in the face for good measure. Jim enthusiastically said it was all part of the experience. I think he was just trying to make me feel better. The Jones Brothers handled the sea great as always and after a half-hour run we pulled up to the hotspot of the day before. 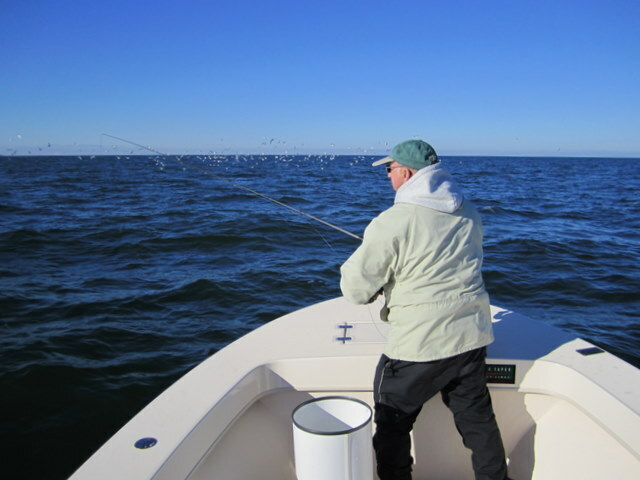 Jim opted for the fly rod and masterfully cast a clouser pattern in the 20k breeze. After just a cast or two he was hooked-up and promptly landed the largest fish of the day – a fat 24″ rock. Chris then got in on the action and boated a nice fish of his own. This back-and-forth went on for maybe an hour, with the guy’s tally approaching ten stripers. They were all fat, feisty and averaged maybe 21 inches. The wind soon increased, prompting the water to become cloudy, at which time the bite turned off like a light. We decided to end the day fishing some creeks and were pleased to discover crystal clear water and flat-calm conditions in a sheltered creek near Smith Island. Only problem was, no one was home. But that’s fishing. As the sun approached the horizon, we beat-feet back across Tangier Sound to and ever-increasing northerly. So much for the diminishing winds. The guys were great sports about the weather and had fun in spite of it. Thanks guys! This last trip was the first of five days of a very strong northerly blow that cost me several trips, but later brought some nice fish into the picture. More on that in the next report..
Josenhans Newsletter ~ Breaking fish starting! 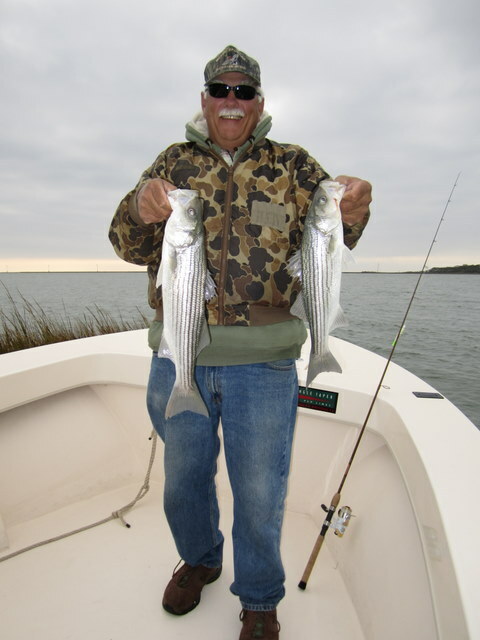 Anyway, as you know from past e-letters we have been fishing the creeks of Smith Island of late for some nice fat school stripers. In addition, we have had acres of breaking rockfish out in the main bay between Holland Light and the American Mariner target ship – that is if the wind allows us to get out there. 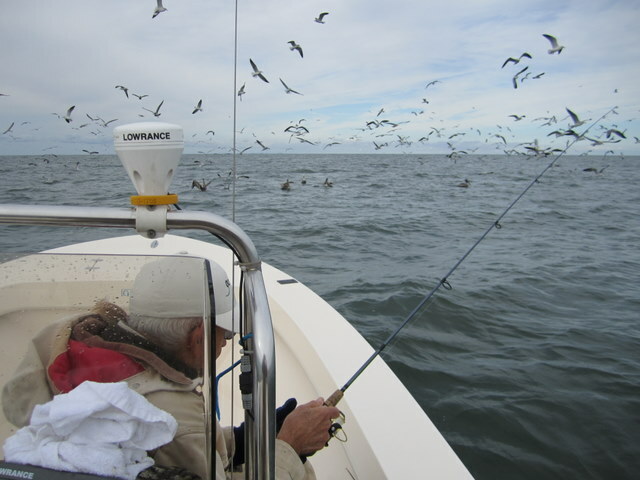 Gannets were diving the other day as we arrived and this usually signals big bait and big fish. 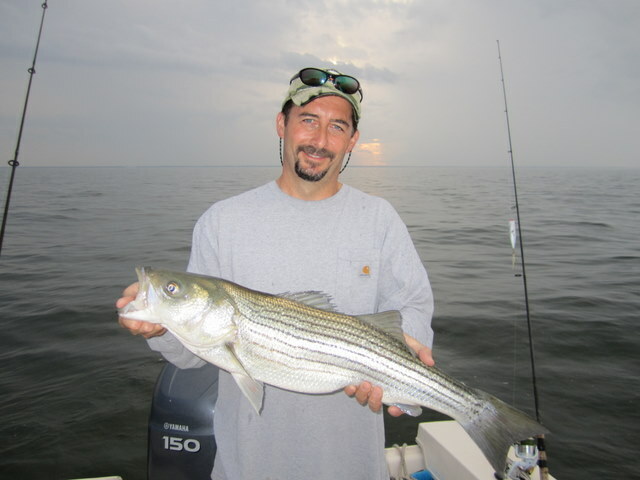 Sure enough, the second tug on the line produced an over-stuffed 32″ rockfish of around 12 pounds! Baby bunker (peanut bunker to some) were being harassed by a nice grade of rockfish and the schools were moving fast. We had a blast for several hours casting Storm shads and Li’l Jimy’s of www.specializedbaits.com. 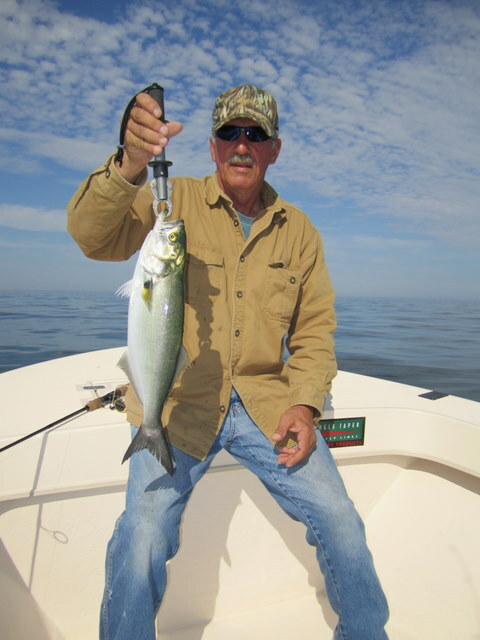 The Li’l Jimy’s were the hot ticket, as they matched the size of the bait to a “T.” Nice looking bucktails, like a custom-tied fly but with a lead head. 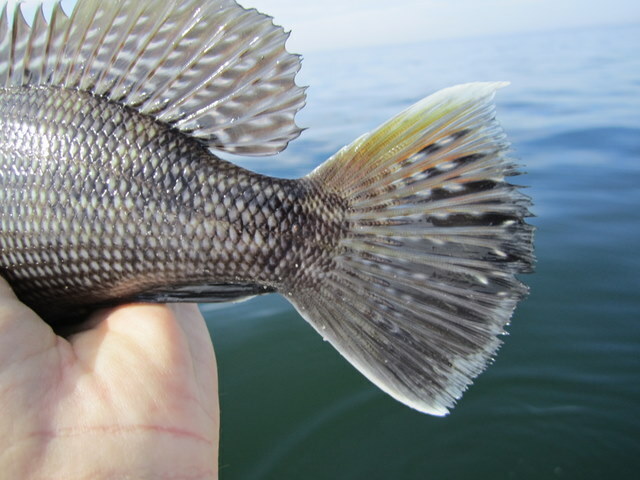 We also ran into a school of 3 – 4 pound bluefish on a recent trip to the SW Middlegrounds. They were tearing up the peanut bunker on the surface making for easy pickings for my group of spin fishermen. Jigged up a fall visitor. Can you identify? Sorry for the long delay in between newsletters. I have been on the water a lot and when I return in the evening the computer keyboard looks sort of blurry. 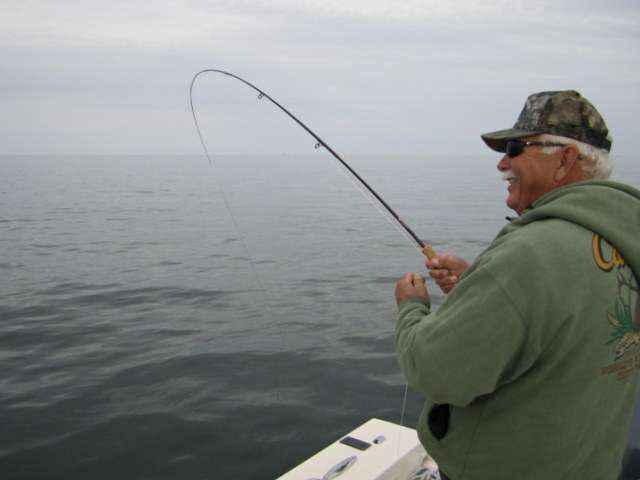 Fishing has been great if the wind allows us to fish the way we want to, if at all. This has been some fall for wind, blowing 15-20 many days. Several trips have been rescheduled, and rescheduled again.. The guys have been great about putting up with the weather and for the most part we have done well. I’m going to change things up a little this week and simply include a few snapshots from some of our trips. Gene Jones hooked up on his 7 wt.